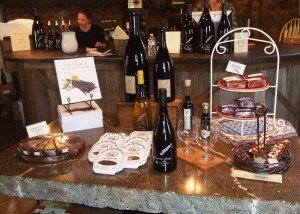 Lavender Ridge’s tasting room sets itself apart from many of the areas’ offerings in two big ways. The answer is not only in the name, it’s also in their incredible cheese parings. Lavender Ridge, the labor of love owned and operated by Rich and Siri Gilpin, offers an incredible assortment of lavender fare — baked goods, dishes, jams, cookbooks, you name it — as well as an artisan cheese market in addition to ten of their very own masterfully crafted wines.